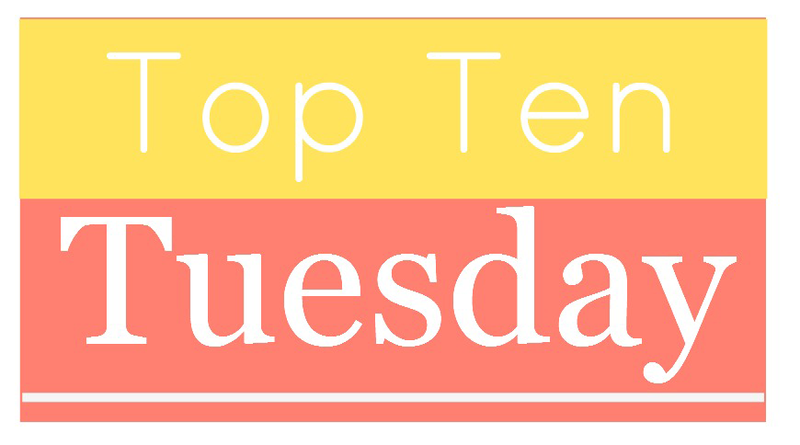 I've never done a Top Ten Tuesday before. While I like memes, sometimes I find them to be a little monotonous and sometimes, I just don't have anything to say. However, this week's topic is one that I can easily come up with: Top Ten Reasons I Love Being a Blogger. 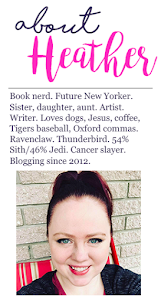 I'm going to write this post as more of a countdown type of thing -- from number ten, to my ultimate favorite thing about book blogging. I'm a very creative person and always have been. From the graphic design to writing about books, everything about blogging is creative. It's an activity I can lose myself in. 9: I can call reading "working"
It's my dream to work in publishing one day. Doing what? I'm not entirely sure. But I look at this blog as a way to explore what things I love in YA and NA literature and to learn about the publishing industry, too. And because I do review ARCs and occasionally do blog tours, I do have deadlines by which I need to read something. And if someone asks me to go hang out and I'm feeling socially awkward that day (which is often) or if there is something I should maybe be doing, but want to wait a little while, I can read and say that it's work. And if my dad asks me to do something, I can say "Hey, can I do it in fifteen minutes so I can finish this work I'm doing?" when the work is one more chapter. Because it is. And one day, I hope I'll find a way to get paid for reading, writing, and loving books. It's not exactly a shock that many bloggers and readers also want to write their own books one day. I'm in the middle of working on two separate ideas right now and my momentum with them kind of ebbs and flows. But since I've been blogging, I find that it's made me a better writer and helps me to hone in on what it is I'm trying to say. After all, good writers read and talk about books. I feel like writing about books I love and identifying what I really like, what was really creative, and even occasionally what I didn't like all help me to figure out who I am as a writer. When I took AP English Literature and AP English Language in high school, my teacher made it mandatory that each of us select one independent novel that we would read over the course of a six week time period and then write an extensive report on, complete with reading logs and questions that required both short answers and full length essays. I don't think I ever did one that was less than fifteen pages. At the end of that six week period, we would all give a small presentation about our books, then discuss them with our classmates, and our teacher would give us prompts to further delve into the intricacies of the novel we read. I simultaneous loved and hated this. But I loved the way it made me dig into a book, between each line, and into the subtleties of the text. I loved that it made me look at books in a new way. I loved flagging nuances with Post-it Notes. Later on, I would love how well this prepared me for college level literature classes. I still love how it makes me look at books. But I loved talking about the books most and I loved hearing about the books everyone else chose and adding them to my TBR list. I still love that. And with a blog, I get to keep doing that. Except now it doesn't have to be a teacher approved book with literary merit. (Most YA would not have been allowed.) It can be whatever I want and I delight in going in and really finding literary merit in unexpected places. And as the field of YA writers broadens, so too deepens the quality of the books on the market. I love being able to share what I loved with other people on this blog, even if only one person ever sees it. At my core, I am an introvert. I can be very much like Hermione Granger in class where I thrive and I loved to perform (singing, dancing, playing music, all of it). But I am more than a little awkward. I easily blend in (unless I'm mad and have an opinion on something), I say strange things, and I live for Friday nights when I can put on my favorite pajamas, then proceed to lay in bed all weekend in the exact same PJs and exist off of books, coffee, and occasionally some junk food. I like to sit with a friend who I'm comfortable with in silence. I like not having to talk all the time. I very much need long quiet car rides after working to decompress. I do not go out of my way to socialize in classes. I bring a book. I read it in the hallway until we can get into the classroom, I read it until the class begins, I read it if and when there is a quiz or a test and I finish early. When class is over, I pick up my things, put them all back in their exact organized spot in my bags, go to my next class and start the pattern over. If it's not a long walk, I read on my way. I'm not saying all book nerd and authors and bloggers are introverts. That would be unfair. None of us are cookie cutter. But when through Twitter, Facebook, and my trip to BEA this past summer, I finally discovered where the rest of the people like me were. I could sit next to new friends in line for signings and read. On the shuttles from Javits back towards Penn Station, however short, most of us had our noses buried in books. And even if some of them are more extroverted, they GET that I'm introverted -- and many extroverts don't get that. I've always loved traveling. I always feel like I haven't gotten to do a whole lot of it and that I'm behind for my age, but that's probably because my mom became a travel agent straight out of high school and continued to be one until just a couple years after I was born. She earned lots of free trips and had lots of great discounts, so by the time she was my age (I'm 28) she had touched her feet down literally all over the world. I think she's been to every country in Europe and most of the continental states, plus Hawaii. She's been on cruises and to the Bahamas. By comparison, I'm not very worldly at all. But I do love it. The difference with me is that I either love going with my family and closest loved ones, or I'd rather just go it alone. I'm very independent like that. Blogging gives you an excellent reason to travel and step out on your own for a new adventure. If I wasn't a book blogger, I never would have ended up in New York City for nine days this past summer. This year, I plan to drive Cincinnati and Nashville for events, and I'm returning to NYC, plus planning to go to Las Vegas for ALA and Comic Con in San Diego. The only ones that are for certain are Cinci, Nashville, and NYC. That's what my very small paycheck from being a coach will cover, but if I'm able to start doing a little more part time work soon, I can cash in some frequent flyer miles and make the others happen. And my sister lives in San Diego, so that's not a major issue. I may be an introvert, but I'm also looking to get into an incredibly competitive field that involves marketing and advertising and social media. And, as KC, the publicist on Gossip Girl teaches Serena: "My only value is my social network." I don't believe that that's my only value, but that quantity does matter. Blogging is a great way to network with people and get to know people in the publishing industry I wouldn't otherwise. Someday, I hope that my social network and all the networking I've done will add up to equal one job in New York City that will put a roof over my head, feed me, and feed my dogs. The very first author I followed on Twitter was Trisha Leigh, the author of The Last Year Saga (one of my favorite book series of all time) and when I Tweeted at her I was SHOCKED that she followed me back and Tweeted back. I was floored! It couldn't possibly be that easy, could it? Sure, there are some authors out there who are so so so bogged down that they can't answer every Tweet. But most authors I've found that I Tweet at actually Tweet me back! I've had lengthy conversations with them. The same goes for people who work at publishers and people who own some of the bigger and more notable book blogs. It's so easy these days to interact with these people that you are connected to by something simple -- a book -- and turn it into an actual friendship. Trisha Leigh (as well as a few others) is now someone I consider a friend. She wishes me a happy birthday on Facebook, she messages to ask how I'm doing with treatment and genuinely care, she introduces me to other really cool authors who I now love to read and whose work I've gotten to review. And most importantly, she honors me with the privilege of reading an advance release copies of her books to review and cares what I think. She spent a whole day with me at BEA welcoming me into her fold. Her books are what made me want to blog. She was the one who told me about BEA and suggested it. She suggested finding a place to stay on AirBNB. She continues to guide me and help me and is genuinely a great person and friend. She isn't the only one (thank you to everyone else who has been so sweet and kind to me, too), but she's the first, and she opened me up to a whole wide world that I didn't know existed at a time when I really felt I was floundering and didn't know what I would do with my life. Within six months of "meeting" her via Twitter, I found myself in the midst of an industry that I knew was for me. She helped me find my new dream, probably without even realizing it. And it's those kinds of relationships that make me say to myself, "Is this really my life? For real?" Maybe I just got lucky that I found the right author at the right time who would inspire me and show me this world filled with friends who I consider to be closer to me than people I live nearby. But regardless, I'm grateful to her and other authors like her. It's what makes book blogging so fulfilling and fun. It's such a great privilege and honor to be a book blogger. Even if an author or publisher didn't solicit you or grant you access to an ARC and you review only books that you bought, there's a chance that what you write about that book will bring it another reader or readers. You have the ability as a blogger to open minds and to lead people to wonderful places you love. You can make a positive difference in the life of an author you love, too. And besides that, can we just acknowledge the amazing-ness that is getting to read a book early before its publication date. I hesitate to use the term "free" because it isn't -- you get it in exchange for a review. But if you love to read, love to talk about books, and love to write about them, it's really the ultimate gift. This hit me the other day when I was walking around the bookstore and seeing so many books that I already own for review and how lucky I was to be granted that privilege and to have gotten to experience them before the rest of the world. When you think about it, authors are all kinds of brave anyway for putting their work out there into the real world, which is their heart and soul, and letting the masses do what they want with it. They're even more brave for handing over a few copies to bloggers knowing that they might not like it and might leave a negative review. I feel so honored and grateful to be a book blogger that authors I care about and am friends with trust. I left BEA for last and as my favorite reason because it really encompasses all the other reasons I love being a blogger. For three days or so (give or take some if you go for extra conferences), all these elements and all the people come together in the name of books. For me, it was life changing and life affirming all at once and one of the greatest things I've ever experienced. If you're a seasoned blogger who has never gotten to go, GO. If you are a new book blogger, don't let that stop you from going -- it's a GREAT launching pad and trust me when I tell you you will love every moment. So that's my Top Ten for this Tuesday. Next week's topic is a "rewind," meaning we can go back and choose a topic we didn't do. I'll be doing my 2014 Goals/Resolutions! Check back here tomorrow for Waiting on Wednesday, a review of The Secret Sisterhood of Heartbreakers, and the unveiling of numbers ten and nine on my Top 13 of 2013. It is a privilege to know YOU, my love. And I'm sure I'm not the only one who feels that way, or is thrilled you found your home with all of us in the publishing world. All the love.